TYPICAL DAY. 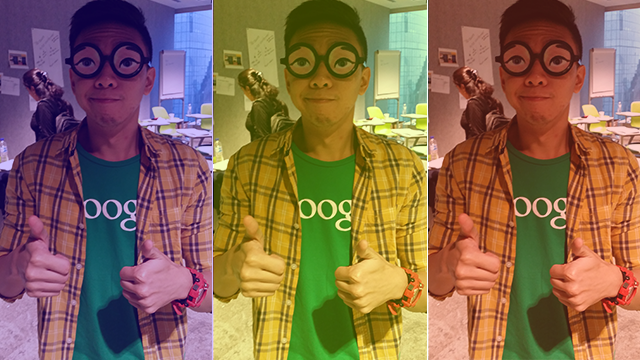 Looks like another typical working day for Google Philippines Industry Manager Jolly Estaris. You may recognize Jolly Estaris as one of the former hosts of children’s show 5 and Up. But he is all grown up now and he is working in an equally cool work place: Google Philippines. So how is it like working for such a tech giant? Jolly gives us a sneak peek into their work and the other awesome things they do at Google. Prior to Google, Jolly worked on both the client and agency side, notably in P&G Singapore in 2006, and Mediacom in 2009. In P&G, he was an assistant brand manager handling Mr. Clean. In Mediacom, he spent the first two years working on above-the-line media planning, and transitioned to digital media planning in 2012. “It was during my role as associate director for Digital Strategy that I got to work with the likes of Google, and that’s how I ended up here,” he said. And what made him finally decide that he wants to work for Google Philippines? “I mean, it’s Google! Who wouldn’t want to work for Google?” he said. For him, it seemed like a natural transition after his work client and agency experience. “What I enjoyed the most during my last two years in Mediacom was really sitting down with brand managers, explaining how these different digital media platforms work. And working for Google would allow me to teach advertisers on a wider scale, to help digitize the rest of the industry,” Jolly said. PERKS. The perks that come with working for Google, as seen in the movie The Internship, are true, attests Jolly. According to Jolly, one of the hiring criteria in Google is something called “Googleyness.” He said that everyone may have their own definition of it, keeping in mind Google’s culture and the principles it stands for. For Jolly, it is about collaborativeness, intellectual humility, and the ability to not take yourself too seriously. “That’s something I see in the people I work with every day, which is really what makes working for Google very inspiring,” he said. When Jolly was applying, he said that he had undergone “a very long process.” However, it did not really involve any of those brain teaser questions you might have seen on the movie The Internship. “Parts of it were tough, but if there’s anything I learned from it, it’s that you should just stick to what you know, and really talk about the unique value you bring to the team. If you try to pretend otherwise, these people will be smart enough to spot it,” he said. He has been in Google for over two years now, currently as an industry manager. His work entails educating clients about Google platforms, but more importantly, helping them craft their own digital ecosystems. 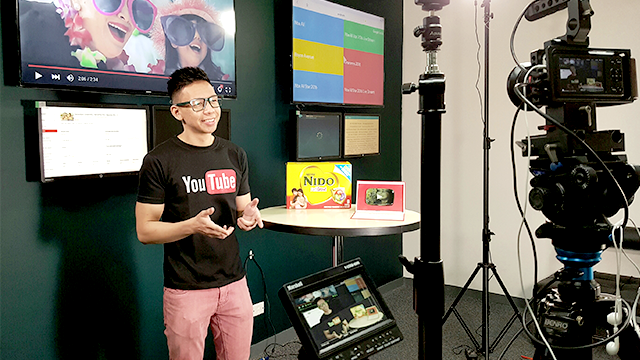 His main focus right now is on video advertising, which he said entails not only teaching their clients the value of supplementing their TV campaigns with YouTube, especially for younger audiences, but also helping them create stories that people will choose to watch and share. “Because the truth is, we don’t go to video platforms like YouTube to watch ads——we go there to watch stories,” he said. SURREAL. Jolly (extreme left) says working for Google feels like quite a surreal experience. Google’s on-ground presence in the Philippines is actually still quite small, so it feels like a startup, according to Jolly. There is a limited number of people handling a lot of different clients, who expect nothing but the best out of Google, and so their challenge is making sure you do not disappoint. “We all feel like we have a big responsibility to this industry, so we always try to create these fun, unique, but still educational experiences that people have come to expect from Google,” he said. This job, of course, comes with perks. Remember the free food you saw in The Internship? Well, Jolly said that is all true. “I think the philosophy behind this perk and others is not just for the sake of giving us free stuff. It’s really meant to make sure we’re able to do work that matters, in the best way possible, by allowing us to worry less about other things,” he said. 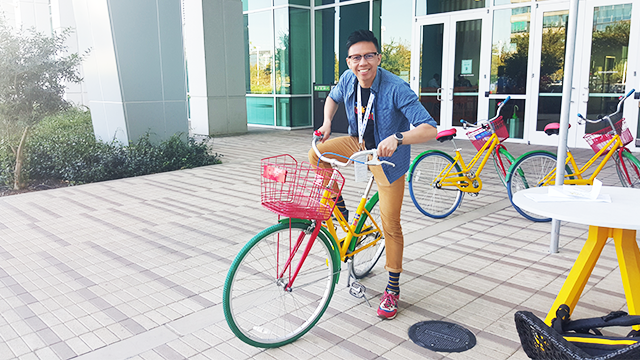 One of his memorable experience working for Google was when he visited the Google headquarters in Santa Clara County, California in October 2015. 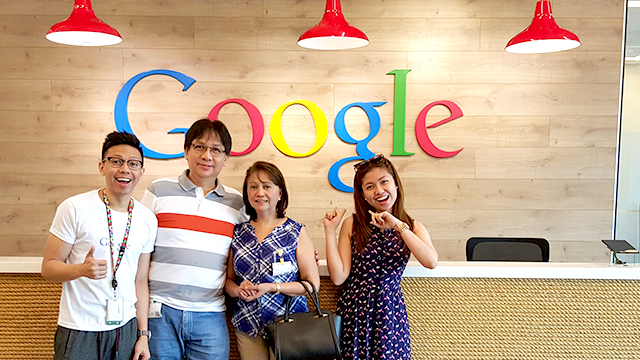 “That was really memorable for me because I remembered sitting on a plane to a company trip back in 2013, where a friend told me there was an opening in Google Philippines. In that moment, I thought nothing of it because I was quite happy where I was. But lo and behold, the in-flight movie was—The Internship,” he said. Fast forward two years later, there he was, in the actual Google campus where parts of the film were shot. “It really was quite surreal,” he added. YOU'RE THE BRAND. Jolly says that to join a company like Google, you have to make yourself as the brand. Want to work for a big organization like Google? Jolly gives two tips. “The first is to learn to see yourself as a brand,” he said. In his 10-year career, he has worked with some of the best from all three sides of the marketing relationship—from client, to agency, and now, the publisher/digital consultancy side. And that is the “branding” he always put across when he does industry talks. “Second—and this is gonna sound cheesy—is to fully embrace all parts of who you are,” he said. Most people may feel like they need to fit a certain mold to be hired by their dream company, but Google, along with the other tech giants of today, are part of a new breed of companies. “So don’t be afraid to break molds and stereotypes,” he added. Jolly considers himself an “absolute nerd.” But over the years, he has learned to embrace the more social side of himself, and got deep into hosting and advertising. In recent years, he even got deep into more physical activities like CrossFit.